You will be given a reference e-book to read And the test will be based on that e-book , you can take final test within 1 year of purchase. Speed reading refers to the collection of reading techniques that aim to help anyone significantly increase his reading rates without having to reduce retention and comprehension. The most common methods used in reading include sub-vocalization elimination and chunking. A reader’s eyes are often fixated on each space and word in a reading material during the reading process. Speed reading takes place when the specific the duration of fixations and the specific number of eye pauses are greatly reduced. A variety of techniques can be used when it comes to increasing reading speed and these include not sounding out all the words present in a reading material, preventing the sub-vocalization of a few phrases, recognizing words without actually focusing on every letter and spending lesser amount of time on a few phrases. Speed reading also refers to the process of analyzing tradeoffs between measures of comprehension and speed, identifying various kinds of reading call used for various comprehension and speed rates and improving the rates through practice. Speed reading methods also include the basic method which involves finding a perfect place for reading, making the reading process more interesting and enjoyable by taking the most comfortable posture and making sure that you get enough intake of oxygen. Skimming is also another effective method and this involves visually locating sentences within a page to get clues about their meaning. Meta-guiding is also an effective speed reading method which can be executed by guiding your eye visually to make it move faster across the text that you are reading with the help of a pointer or your finger. 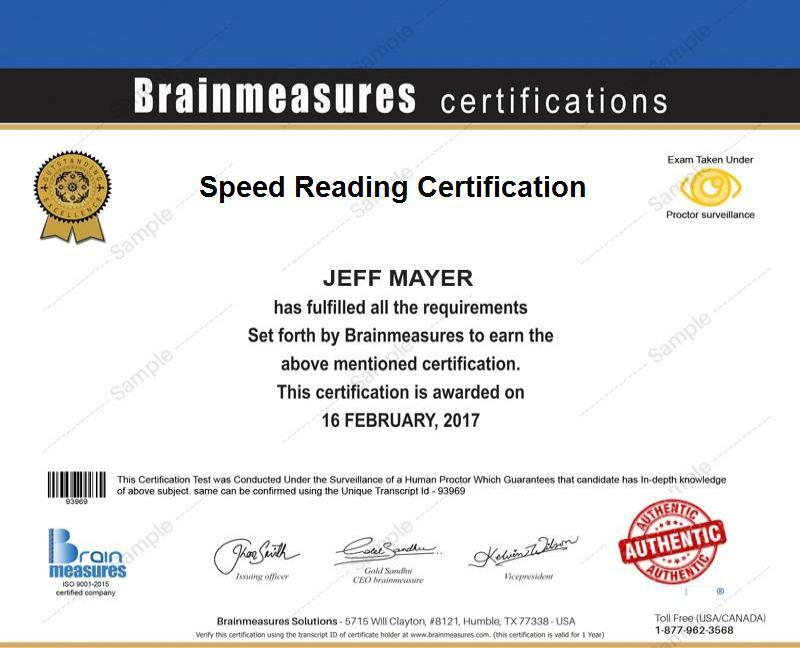 If you are planning to fully understand all the effective techniques linked to speed reading, then enrolling in the Brainmeasures speed reading certification program can do you a lot of good. As the leading online certification and employment testing company worldwide, Brainmeasures can be expected to supply you with an adequate amount of information regarding the basics of speed reading. With the help of the speed reading course offered by Brainmeasures, you will no longer find it hard to significantly increase your reading speed. The good thing about the company is that it also offers a comprehensive and accurate online reading test which aims to further enhance your skills in reading speedily without having a hard time comprehending the message of a reading material. It is highly important for you to pass the speed reading exam as a passing percentage will serve as your ticket towards getting your speed reading certificate. A speed reading certification program can benefit a lot of individuals in various circumstances and situations. The certification course is most suitable for high school and post-secondary level students who need to read large amounts of information and long lists within just a limited period and white-collar workers or any other professional in the corporate and business industry who need to improve their productivity by quickly reading letters, faxes, new reports and memos every day. Hundreds of individuals and professionals are in need of speed reading experts to help them significantly improve their speed in reading while ensuring that their comprehension skills are still on the highest level. If you already hold your speed reading certification and you plan on practicing your expertise in this field, then expect your average annual salary to be around $65,000 and you can expect this amount to grow as you gain more experience in the field.